Geelitarvikud There are 27 products. High quality thin Bonder will give the perfect adhesion between the gel and the nail surface. It can also be used instead or with Primer. Apply on prepared nail as a one thin layer. Cure in UV lamp for 2 minutes. High quality thin Bonder will give the perfect adhesion between the gel and the nail surface. It can also be used instead of Primer. Apply on prepared nail as a one thin layer. Cure in UV lamp for 2 minutes. For best results, we recommend using both Primer and Bonder. Acid Free Primer is a adhesion promoting liquid that removes humidity from the nail layers. When the nail preparation has dried, apply it thinly on the nail removing the access material off the brush on the neck of the bottle or on a paper towel. Primer is in a bottle with brush. Primer is a adhesion promoting liquid that removes humidity from the nail layers. When the nail preparation has dried, apply it thinly on the nail removing the access material off the brush on the neck of the bottle or on a paper towel. Primer is in a bottle with brush. Nail forms for both gel and acrylic nail extensions. Suitable with every nail shape. Nail forms for both gel and acrylic nail extensions. Both sides of nails forms can be used. Suitable with every nail shape. Elegant syntetic brush that is great for French manicure and 3D design. Soft and elastic brush with high-quality syntetic hair is great for application. Other skew end of the brush can be used for removing of sticky gel layer. Kvaliteetsest metallist geelipintsel, pehme ja elastse karvaga. Lame ja kandilise kujuga pintsel sobib hästi erinevate geelide pealekandmiseks. Pintsli saba saab pärast tööd kasutada mugavalt pintsli korgina. Vaata alltoodud piltidelt. Nail Prep prepares and desinfects natural nails and should be applied before primer or bonder. Nail Prep is really useful for problematic nails, as it gives better adherence to gels and acrylics. Product is in 118ml bottle with spray. Acetone with apple green fragrance is a liquid to remove gel polish. 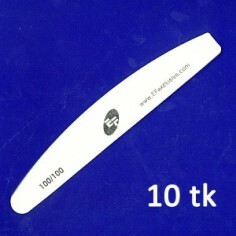 Perfect for remove wrongly stick tips or remove decoration from nail plate. Incredibly effective. 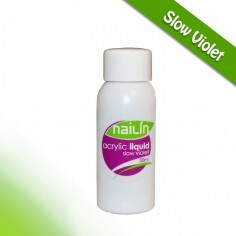 Quickly dissolve acrylic and tips enabling smooth removing of artificial nails. Efficient and reliable. Foil Gel creates a tacky layer enabling you to adhere your transfer foils to. Can be used for larger surfaces or create the most detailed designs. 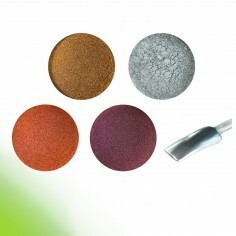 This Foil Gel is highly pigmented which enables you to use as a traditional color gel as well. 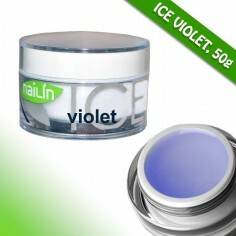 Cures in UV lamp (36W) in 2 minutes.